We’d love your help. Let us know what’s wrong with this preview of Mirror Image by Michele Pariza Wacek. Six months after Linda's sister Elizabeth killed herself, Linda has finally gotten her life back to some semblance of normalcy. Until a killer appears who is stalking men ... a killer who resembles Elizabeth ... a killer who seems somehow familiar to Linda. And, to make matters worse, Steve, her old high school crush and now a detective, is assigned to this case. He's aski Six months after Linda's sister Elizabeth killed herself, Linda has finally gotten her life back to some semblance of normalcy. Until a killer appears who is stalking men ... a killer who resembles Elizabeth ... a killer who seems somehow familiar to Linda. And, to make matters worse, Steve, her old high school crush and now a detective, is assigned to this case. He's asking Linda all sorts of questions, questions Linda couldn't possibly have an answer to. There's no reason for him to be investigating Linda. She couldn't possibly have anything to do with this. To ask other readers questions about Mirror Image, please sign up. Young single men are being brutally murdered. They are found in their beds, hands lashed to the headboard, naked, and with cut throats. There is a look of terror on their faces. Linda is not having a good life. Her sister, Elizabeth, committed suicide 6 months earlier, and even though her body has never been found, there were witnesses. Linda isn't exactly grieving ... she feels guilt and maybe some relief for the most part. It's really taking a toll on her health. She's lost so much weight, she' Young single men are being brutally murdered. They are found in their beds, hands lashed to the headboard, naked, and with cut throats. There is a look of terror on their faces. It's really taking a toll on her health. She's lost so much weight, she's starting to look like a scarecrow. She eats less than a bird.. she's just never hungry. But the nights are the worst. Nightmares plague her to the point where she sleeps very little, even with the help of pills and alcohol. She's having blackouts where hours disappear and she has no idea where she's been or what she's done. But when she starts seeing the dead men in her nightmares, that's when she gets really scared. A former friend ... one who dated her sister ... is now a detective and he's buzzing around Linda asking all kinds of questions. Are you sure your sister is dead? Seems like someone closely resembling Elizabeth was seen with both the men who have been murdered recently. And now she's seeing Elizabeth every time she turns around. Has Elizabeth returned from the dead? Did she fake her death in order to murder? Or, as Linda is afraid of ... is someone impersonating Elizabeth? And is it her? This was a super story! Every other chapter or so tells about Elizabeth's home life and how if affected everyone around her. By the time the ending was near, I couldn't tell what was real and what wasn't. The first chapter was terrific ... grabbed hold and didn't let go until the very end. I read this one in one setting .. just could not put this one down. Many thanks to the author / Love-Based Publishing / NetGalley who provided a digital copy in exchange for an honest, unbiased review. Young single men are being tortured and murdered in bed and founded naked in their bed. Such a havoc and terror situation in the town. Linda - the main character grew up in an abusive household along with her four brothers and little sister Elizabeth, who committed suicide six months ago, even though her body is never been found and there were witnesses. Linda was mentally disturbed as she feel guilt about Elizabeth's suicide in result she eats like a bird and she is having nightmares plague her Young single men are being tortured and murdered in bed and founded naked in their bed. Such a havoc and terror situation in the town. Linda - the main character grew up in an abusive household along with her four brothers and little sister Elizabeth, who committed suicide six months ago, even though her body is never been found and there were witnesses. Linda was mentally disturbed as she feel guilt about Elizabeth's suicide in result she eats like a bird and she is having nightmares plague her to the point where she sleeps little even with the help of pills and alcohol which leads to major weight loss. Steve, a guy she knows from school, who once dated Elizabeth has come back into her life, is investigating the brutal murders and he believed at some points by the evidence he got from the victim's place Elizabeth faked her suicide and doing these murders, at some point even Steve also believed that the murders and Linda has a connection. Even 1 case Linda saw the victims face in her nightmare and the murder are happening on the same period of time when she had blackouts. She's unsure, but things keep happening - time she can't remember, nightmares, and police officers that act like she's hiding something - all leading her to feel (and act) more guilty. Can Linda be the murderer Or Its Elizabeth who faked her death and still alive and doing this heinous crime or someone who disguised as Elizabeth and doing this murders to make Linda look guilty and criminal? I really enjoyed this book and totally recommend this book to who like the suspense. This book maintains the suspense throughout, constantly keeping you guessing as to the true identity of the serial killer. This one is sure to hold your attention from beginning to end. Linda grew up in an abusive household along with her four brothers and little sister, Elizabeth, who committed suicide six months ago. Everyone in the family has handled the death differently, and it (as well as behavior by her family) hit her hard. Lately, though, she's been having dreams about Elizabeth - and is even sure that she saw her one day while she was on her way home from work. Maybe it's the fact that Steve, a guy she once knew, has come back into her life, investigating a string of murders and believing, at least on some level, that Elizabeth did not die. Maybe it's the stress of the first family dinner (and holiday) since Elizabeth's death, and the fact that at least one of her brothers blames her for what happened. She's unsure, but things keep happening - time she can't remember, nightmares, and police officers that act like she's hiding something - all leading her to feel (and act) more guilty. Can she be the murderer? Or is Elizabeth still alive? Who would go through all of this trouble to make Linda look (and feel) guilty? I am a big fan of psychological thrillers, so when this was suggested to me, I decided to give it a go. The book description drew me in and the title of the novel had my brain working from the very first page, wondering how the two go together. As the story went on, though, it felt more like a cozy mystery with a little bit of paranormal thrown in, and the way things worked out just seemed a little too easy with "facts" that, up until the end, were just things Linda believed without much question. The two characters I liked the most were Mrs. Jensen and Don Shimon. Unfortunately, they were not actual characters in the story, but more like side people who had known the family once upon a time. I'm still not really sure what they were there for, other than the fact that we find out a lot of the background on the family - through memories and observations - from these two. For some reason, the family popped into their heads at some random time (or at least that's the way it seemed), and through that, we find out answers to some nagging questions, things that didn't make sense. Had they been actual characters in the story, I would have thought this was a great idea, but to just throw in two chapters (one for each) where they share all this information about what has happened in the past just seemed a little too easy. The story itself has a lot of good points. Most specifically, the information dumps I spoke of above. They didn't feel like information dumps, even though that was what they were, and gave us a different look at Elizabeth, all from things that they had noticed from afar. I also enjoyed the way the story worked itself out at the end. I would recommend the book if you want some light reading with a little bit of suspense, and it would be nice to see the author do an additional story with some of these characters - I think Terri would make a great private investigator. Linda can't eat or sleep and is plagued by vivid nightmares in which she sees men getting killed before reading about them in the paper. Detective Steve Anderson - Linda's high school crush and her sister Elizabeth's ex-boyfriend - seeks Linda out with the possibility that Elizabeth might be committing these crimes. The only problem is that Elizabeth died six months ago. Then Linda starts having blackouts and losing time. Could she herself have something to do with the deaths? Mirror Image is a c Linda can't eat or sleep and is plagued by vivid nightmares in which she sees men getting killed before reading about them in the paper. Detective Steve Anderson - Linda's high school crush and her sister Elizabeth's ex-boyfriend - seeks Linda out with the possibility that Elizabeth might be committing these crimes. The only problem is that Elizabeth died six months ago. Then Linda starts having blackouts and losing time. Could she herself have something to do with the deaths? Mirror Image is a combination of family drama and psychological suspense, with a slight supernatural element. The story is told mainly from Linda's perspective. However, the first chapter is told from the point-of-view of the victim, and there are a couple of chapters in which past acquaintances detail the strangeness of Elizabeth as a child. The author uses scent to great effect, as well as the recurring symbolism of mirrors and reflections. She deftly maintains the suspense throughout, constantly keeping you guessing as to the true identity of the serial killer. THIS IS A VERY INTERESTING PSYCHOLOGICAL THRILLER ABOUT A HIGHLY DYSFUNCTIONAL FAMILY WITH A VERY UNUSUAL CHILD. THE WHOLE FAMILY SEEMS MESMERIZED BY ELIZABETH EXCEPT FOR LINDA...ELIZABETH ALWAYS GOT LINDA IN TROUBLE AND THEN SEEMED TO ENJOY SEEING HER ABUSIVELY DISCIPLINED. ELIZABETH DIED...OR DID SHE? SIX MONTHS LATER, LINDA IS SUFFERING WITH EXTREME NIGHTMARES, IS LOSING WEIGHT RAPIDLY AND IS NEEDING TO HIDE THE DARK CIRCLES AND PALE SKIN WITH MAKEUP. AFTER SOME BIZARRE SITUATIONS, LINDA FEEL THIS IS A VERY INTERESTING PSYCHOLOGICAL THRILLER ABOUT A HIGHLY DYSFUNCTIONAL FAMILY WITH A VERY UNUSUAL CHILD. THE WHOLE FAMILY SEEMS MESMERIZED BY ELIZABETH EXCEPT FOR LINDA...ELIZABETH ALWAYS GOT LINDA IN TROUBLE AND THEN SEEMED TO ENJOY SEEING HER ABUSIVELY DISCIPLINED. ELIZABETH DIED...OR DID SHE? SIX MONTHS LATER, LINDA IS SUFFERING WITH EXTREME NIGHTMARES, IS LOSING WEIGHT RAPIDLY AND IS NEEDING TO HIDE THE DARK CIRCLES AND PALE SKIN WITH MAKEUP. AFTER SOME BIZARRE SITUATIONS, LINDA FEELS SHE IS LOSING HER MIND! WHO CAN SHE TALK TO?WHO CAN SHE TRUST? THE ONLY TWO PEOPLE IN THE WORLD SHE CAN CONFIDE IN IS HER OLDER BROTHER AND TERRI, HER FORMER COLLEGE ROOMMATE. HER BROTHER, CHAD, HAS HIS OWN SERIOUS ISSUES SO LINDA TURNS TO TERRI TO CONFIDE IN. THE VARIOUS WEIRD DREAMS AND STRANGE OCCURRENCES, KEEPS THE READER "ON THE EDGE OF HIS/HER SEAT". WITH THE STORY SLOWLY BUILDING TO THE CLIMAX, THE READER ISN'T SURE WHAT TO EXPECT...IS LINDA INSANE? THE BOOK COVER AND TITLE WERE CLEVERLY DESIGNED...SIMPLE, YET EFFECTIVE. THE CHARACTERS WERE VERY WELL DEVELOPED AND THE BACKGROUND SCENES EASILY VISUALIZED. THE MAIN ISSUE I HAVE WITH THIS BOOK IS ELIZABETH IS NEVER TRULY DEFINED. THE READER IS LEFT WITH QUESTIONS UNANSWERED. *Thank you, Netgalley, for a copy of this book in exchange for an honest review. I seem to be posting one of the first reviews for this book, so I don't want to give anything away. First of all, I think that this author is very talented and I enjoyed her writing style. The characters seemed to be underdeveloped though, which sort of bothere *Thank you, Netgalley, for a copy of this book in exchange for an honest review. First of all, I think that this author is very talented and I enjoyed her writing style. The characters seemed to be underdeveloped though, which sort of bothered me. I kind of liked the main character, but that's about it. I really liked this story line - it was unique and interesting. I've never read anything quite like it. For the most part, I felt like it had a lot of suspense which is nice, but a lot of parts seemed to really drag on longer than they needed to. WOW!! This book took you on a roller coaster ride. I meant to start this book on takeoff of a plane trip to California. Put it down to watch the scenery and then pick it back up for the descent. That didn't happen. I ended up finishing it on the plane. The story of family history and how it can lead to enough psychological trauma to make a serial killer with a dose of the supernatural thrown in for affect makes for a bumpy ride that left you satisfied but wanting more. I was given a free copy of WOW!! This book took you on a roller coaster ride. I meant to start this book on takeoff of a plane trip to California. Put it down to watch the scenery and then pick it back up for the descent. That didn't happen. I ended up finishing it on the plane. The story of family history and how it can lead to enough psychological trauma to make a serial killer with a dose of the supernatural thrown in for affect makes for a bumpy ride that left you satisfied but wanting more. This is the first psychological suspense thriller I have read and kept reading page after page. This is well written with interesting characters. I thought I had it figured out but I was very surprised at the end. Great storyline and all the crazy characters, this was a real well written mystery. I enjoying how the flow of the writing kept your interest page after page. Thank you for a wonderful read. This review is also posted on my main blog, English Blonde. Mirror Image follows our main character Linda, who is not exactly having the good life she hoped for. She came from an abusive home, and her sister, Elizabeth committed suicide earlier this year, leaving no body behind. Due to her sister’s death, part of her feels guilt for never noticing anything wrong, and also relief due to the trials and tribulations that she put her through as both a child and an adult. Due to all of this Linda’s he This review is also posted on my main blog, English Blonde. Mirror Image follows our main character Linda, who is not exactly having the good life she hoped for. She came from an abusive home, and her sister, Elizabeth committed suicide earlier this year, leaving no body behind. Due to her sister’s death, part of her feels guilt for never noticing anything wrong, and also relief due to the trials and tribulations that she put her through as both a child and an adult. Due to all of this Linda’s health is on a downward spiral, causing her to significantly lose weight and for her mental health to decrease. Which cause her to have blackouts, where hours disappear, causing her to have no idea where she has been or what she has done. And when men are getting murdered in her town and she starts seeing the dead men in her nightmares, she can’t help but freak out. And when a former friend turned detective arrives back in time and starts asking questions, which Linda doesn’t want to know the answers to, she can’t help but get more stressed. 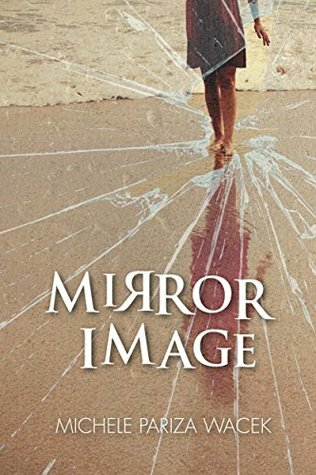 Mirror Image is not a long book, however it took me quite a while to get into it, however as soon as I was about 60% in, I was hooked and couldn’t put it down. I loved the tension the book created, as it even left me guessing on what the genre really was. The writing was overall good, and I thought the point of view change on the chapters was quite refreshing, as the book was predominately in Linda’s point of view, however every few chapters there would be a character from different points in Elizabeth and Linda’s life, giving further insight into their lives and what Elizabeth really was like as a child. And another point is that I did not guess the plot twist at the very end, which recently I have been doing an awful lot of. One of the only negatives I have for this book is that there was some unanswered questions at the end, these could be simply due to me missing the part or it was meant to be left open. Overall, I really enjoyed the book as I really enjoyed the writing and hopefully I shall be reading more of Michele Pariza Wacek's books in the future. This is a psychological thriller and suspense novel where men who frequent bars are no longer safe and could end up the next murder victim, bound and in their beds and butchered to death with a knife. seen as weak beings, bearing the brunt of physical attacks from their father, as well as their 3 othe This is a psychological thriller and suspense novel where men who frequent bars are no longer safe and could end up the next murder victim, bound and in their beds and butchered to death with a knife. seen as weak beings, bearing the brunt of physical attacks from their father, as well as their 3 other brothers. Growing up, Linda always saw the power that Elizabeth held not only within her family but with all men that came into her path. Linda also found that her power was used to torture Linda, whether it be ensuring that she was always blamed and beaten at home, or knowing that she could have any guy that Linda fancied. It has been six months since Elizabeth took her own life, and Linda is living in auto-pilot when Linda's high school crush, now detective Steve, has put the notion in her head that Elizabeth is the main suspect of their serial murder investigation. When the questions turn to near accusations, Linda and her friend Terri try to make sense of Linda's nightmares, the ongoing murder investigation, and its connection to her deceased sister. Losing a sibling takes a hard hit on a person. Linda is bearing the brunt of her sister Elizabeth's suicide - she's lost a ton of weight and begins having nightmares about the men who have started showing up brutally murdered. Linda feels guilty about her sister turning to suicide but she's also feeling a sense of relief which causes her even more troubles - especially with sleeping! Her sister's body was never found and even with witnesses, it's hard not to wonder if she's still alive when witn Losing a sibling takes a hard hit on a person. Linda is bearing the brunt of her sister Elizabeth's suicide - she's lost a ton of weight and begins having nightmares about the men who have started showing up brutally murdered. Linda feels guilty about her sister turning to suicide but she's also feeling a sense of relief which causes her even more troubles - especially with sleeping! Her sister's body was never found and even with witnesses, it's hard not to wonder if she's still alive when witnesses place her with the men who were murdered. Linda's high school crush shows up as a detective on the murders of the young men adding another complicated dynamic to the story. While he's not necessarily convinced that Linda or Elizabeth is responsible, his line of questions puts doubt into Linda's mind. She's having period of blackouts and even believes that she's seeing her sister out and about. The weight of either couldn't be an easy burden to bear. Several times, I had chills running down my spine! The psychological terror of the unknown keeps you reading page after page. Dealing with the suicide is more than any one person should have to handle but when you think your sister may have faked it and is now a serial killer, can you imagine how that would make you feel?! The mystery is held together with a little bit of supernatural attributes that, if heightened, could have added another dynamic to the book. I received a free copy via Worldwind Virtual Book Tours - all opinions are 100% my own! Michele Pariza Wacek has a winner on her hands with Mirror Image. This novel is a psychological thriller that is set in small town Wisconsin. Linda has lost her sister to suicide and has spent six months trying to deal with her grief. When murders begin happening, a high school crush turned cop comes to visit. He doesn't believe Linda committed the murders but her dead sister has been sighted at the bars with the victims prior to their deaths. Wacek penned a suspenseful novel that had me hanging Michele Pariza Wacek has a winner on her hands with Mirror Image. This novel is a psychological thriller that is set in small town Wisconsin. Linda has lost her sister to suicide and has spent six months trying to deal with her grief. When murders begin happening, a high school crush turned cop comes to visit. He doesn't believe Linda committed the murders but her dead sister has been sighted at the bars with the victims prior to their deaths. Wacek penned a suspenseful novel that had me hanging on until the last page trying to figure out what would come next. If the book had been more focused on the police department and Linda's high school crush Steve, I would anticipate a series of novels based on Steve but truthfully, Linda carries the book. I loved the book as I could not figure out the mystery as I read it. At first, I followed the logical thinking of who was doing the killing but I was wrong. It was the final pages that finally had me getting the right killer, just a page before Wacek revealed the same. I strongly recommend you pick up Mirror Image. WOW! This book starts out with a bang and just keeps going! This story is edge-of-your-seat suspenseful, a little creepy, and even sad in spots. A definite page turner, I didn't want to put it down. Oh I tried so hard to figure this one out. I thought I had it once but I was way off. This was a story that was expertly woven right up to the perfect wrap-up at the end. The author never misses a beat. Excellent character development. I loved Linda and Steve (the cop) and Elizabeth (who was supposed to WOW! This book starts out with a bang and just keeps going! Excellent character development. I loved Linda and Steve (the cop) and Elizabeth (who was supposed to be creepy) was great as well. They were all portrayed to perfection. This is what a thriller/suspense is supposed to feel like! It was so intense - parts of this book gave me goosebumps and parts of it made me cry! This would seriously make an excellent, but creepy, movie! A huge Brava for Michele Pariza Wacek, I would love to read more by this author. Thank you to Netgalley for an advanced copy to review! That first line of the description immediately grabbed my attention and made me want to read this one! The storyline unique and unlike anything I've read before. For the most part, I felt like there was great suspense and intrigue. The ending was completely unexpected which is always a Thank you to Netgalley for an advanced copy to review! That first line of the description immediately grabbed my attention and made me want to read this one! The storyline unique and unlike anything I've read before. For the most part, I felt like there was great suspense and intrigue. The ending was completely unexpected which is always a plus! I did feel like a few of the narratives could have been much shorter; some parts were pages long and very descriptive, while others were quick and straight to the point. It lacked some consistency. I also think it would be more powerful written from the main characters point of view instead of a third person point of view. I received this book from the publishers for exchange of giving a honest review. I would recommend this book to people who enjoy reading uncanny books because the author Michelele Pariza Wacek, does an excellent job writing a sinister and mysterious story. The story honestly made my nights a little terrifying after reading a few chapters before bed or a night out. I do not want to give any bits of the story away, so if you do see this book in the library or store it definitely is something you s I received this book from the publishers for exchange of giving a honest review. I would recommend this book to people who enjoy reading uncanny books because the author Michelele Pariza Wacek, does an excellent job writing a sinister and mysterious story. The story honestly made my nights a little terrifying after reading a few chapters before bed or a night out. I do not want to give any bits of the story away, so if you do see this book in the library or store it definitely is something you should pick up and read during your spare time. Lastly, but not very importantly the paper quality of the book is quite good compared to your more common paper books. Well to start with I really liked this story line, I thought it was different and I've never read anything similar to it. Its a psychological thriller set in Wisconsin. Linda's sister comitted suicide 6 months ago and she's struggling to deal with her grief and come to terms with it. Single men are been hunted and murdered, and Linda is having blackouts where hours disappear and she has no idea where she's been or what she's done. Is kinda the murderer? Twists and turns galore in this book, really Well to start with I really liked this story line, I thought it was different and I've never read anything similar to it. Is kinda the murderer? Twists and turns galore in this book, really enjoyable I didn't figure it until the author decided to put it on a plate....! I won a copy of this book in a giveaway on goodreads. Leaving a review was option. Everyone has already described this book so I see no need to be repetitive . After my last several reads, this one was welcomed. It's a rather easy book to get wrapped up in and on the first day of reading , I read past lunch and dinner without realizing it. I've no responsibilities at home other then a cat so it wasn't an issue lol. I'd certainly recommend this book to my friends. First things first, this had that creepy myterious vibe up until the last pages. I'm crying. This is how psychological thriller-mystery should be. Second, when you're writing a psychological thriller-mystery, make sure you put a lot of action and drag the climax in an action-packed way. It all happened ssooo fast I didn't know what to do after I read that "The End"
Linda is from a violently abusive family, yet her younger sister Elizabeth was worshipped as a princess by their father and brothers. After Elizabeth commits suicide a serial killer resembling her begins haunting Linda's life. As this story plays out you, along with Linda, try to figure out what's really going on. Is she having a breakdown? Is Elizabeth somehow still alive? Is something supernatural happening? You'll have to read it to find out. This book was absolutely exceptional. It had just the right amount of suspense to keep me wondering and to keep me trying to solve the mystery. Another thing that I really enjoy about this author is the dynamic between her characters and all of the layers they go through in discovering who they are to themselves and to each other . Borderline supernatural murder mystery. Lots of suspense and suspicious characters make it impossible to determine who the real killer is and the motive until the very end. Thank you NetGalley and Love-Based Publishing for the ARC in exchange for an honest review. At first I wasn't sure what this book was about. It seemed like some supernatural factors going on... it definitely kept me guessing until the end, Great suspense novel. I really enjoyed this book right up until the end. It just kind of touched on the super natural aspect and I wanted a little bit more of an explanation. This is not the type of book I normally read , however I am glad I did. It kept me guessing the entire time. I read it in one sitting , I just couldn't put it down . I received this books from Goodreads Giveways. I really enjoyed the book and it pulled me in. I don't usually read paranormal thrillers but it got me hooked right away.